We are up at 7.30am and have breakfast in the room. 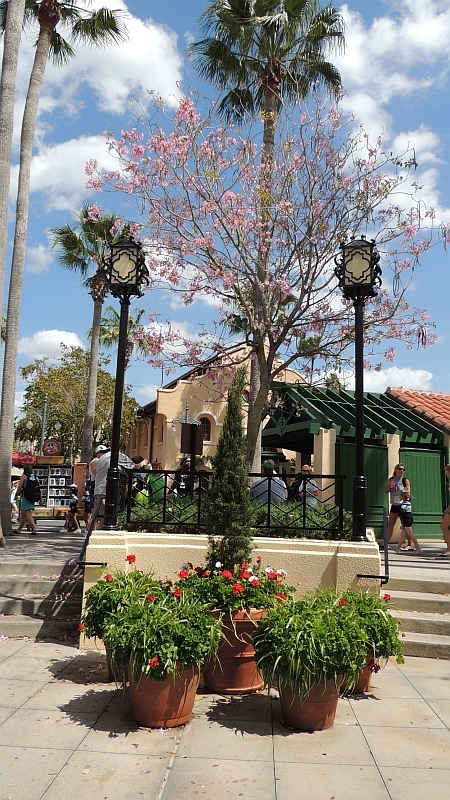 Our plan today is to go to Disneys Hollywood Studios and do a few rides, a late lunch at the new patio lounge at the Brown Derby before heading over to the Magic Kingdom for the evening, as its open until 2.00am. As we are getting ready Tam declares that she has left her duck feet at home. These are shoe inserts to help with her fallen arches and flat feet. There is much sighing as she puts on her trainers. Suddenly she remembers that they are in the boots she wore on the flight. She removes them from the boots and fits them into her trainers and puts them back on. She then says shes put the left insert in the right trainer and vice versa. Trainers off again and the inserts are swapped round. The next moment she tells me that she hasnt bought any clothing for warm weather. Excuse me? We are going to Florida and you havent bought enough warm weather clothing? Im only glad the rest of the family is here to share the disdain. Out of the door at 8.30am and we catch the bus to Disneys Hollywood Studios. So far I am not getting the argument that Kidani Village is too far from the parks. It only takes 10 minutes. The buses have been really good so far. Its another beautiful day, its going to be in the mid 80s and breezy. The downside is theres a storm a comin. Tomorrow afternoon/evening its supposed to be very wet and windy. Ah well, Im sure well have a good time anyway. The first thing we do is go to see The Legend of Jack Sparrow as the girls say its good. Its only a short show, but has some good special effects. Its like having Johnny Depp in the room with you, which makes the ladies more than a little gushy. On to The Great Movie Ride and then we use our first Fastpass+ for Star Tours. Its strange, but both Tam and I come off feeling slightly queasy, perhaps its because we were in the back row. 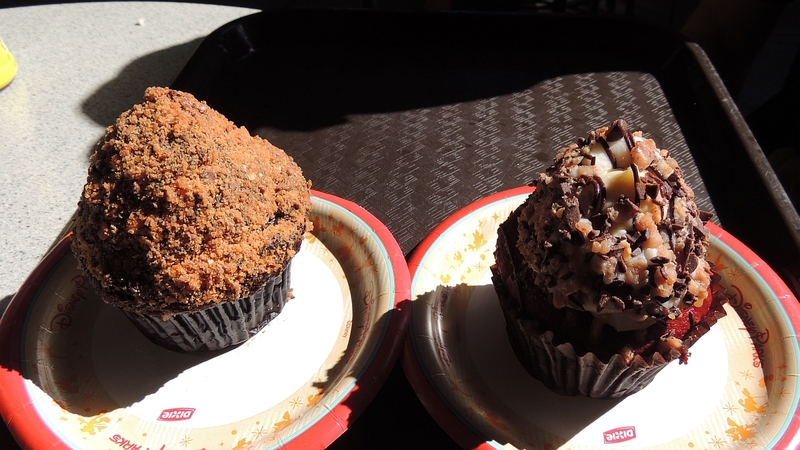 The best thing when you are feeling queasy is a large cup cake (or so Tam informs me), so its off to Starring Rolls. Tam and India split a Butterfinger Cup (roughly the size of a football), whilst Georgia and I grapple with a Red Velvet Cheesecake Cupcake. Heck, these things are sweet. Holy cup cakes Batman, they're massive. Over to Little Mermaid to use our second Fastpass, closely followed by Toy Story Mania for the third. Something happens here that is inevitable, but unremittingly sad. Both India and Georgia beat my score. Theres only one thing to do in circumstances like this  buy a beer. Beer in hand we head to the Beauty and the Beast Show. I really enjoy this. Sitting with a beer watching a show I havent seen for a few years is very nice. I know most people like the big rides, but this is Disney to me. 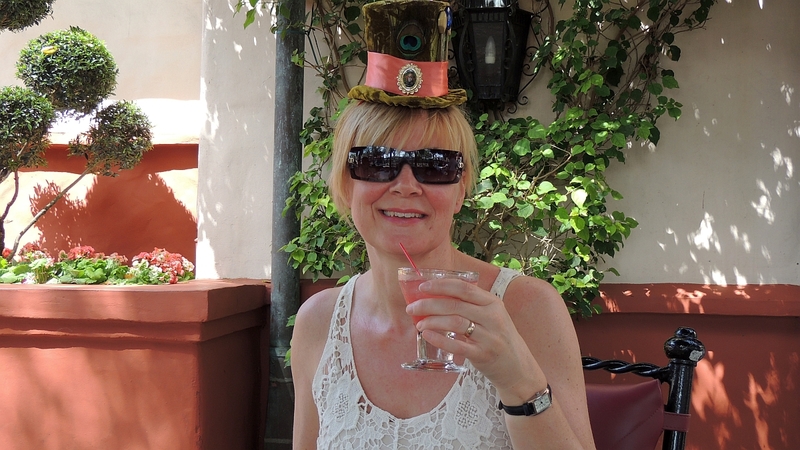 Lunch is required, so we go to the Patio Lounge at the Brown Derby at 1.45pm. I like this place. The tables outside allow you to watch the world go by. Unfortunately the meal isnt quite as good as wed hoped. 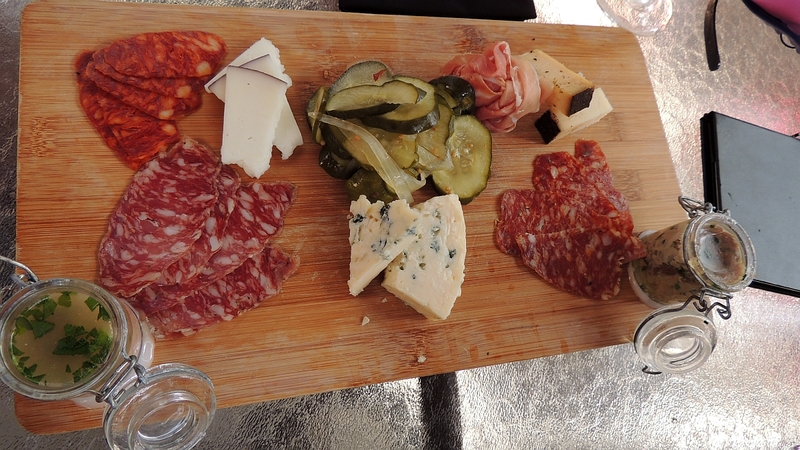 We order sliders, mussels and the charcuterie. Along with this Tam, Inds and I have a margarita flight each. The food comes and Tam tries the mussels. They are cold. I then try a slider and thats cold as well. The server is fine and replaces both. 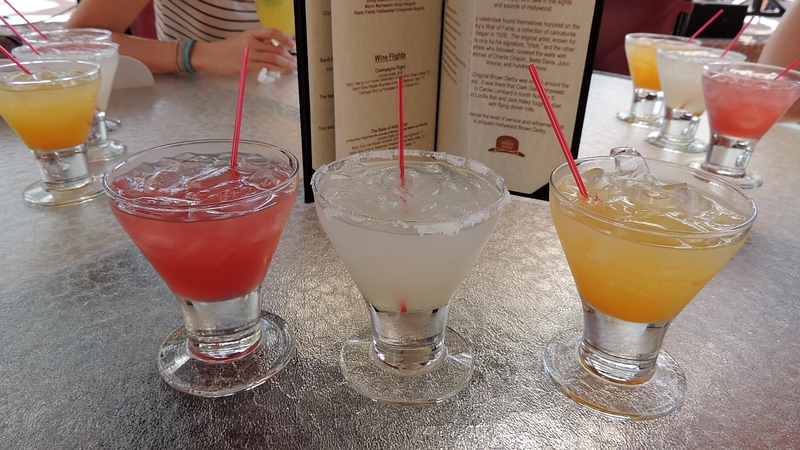 The margarita flight is fine, but gets a bit watery as the ice melts. 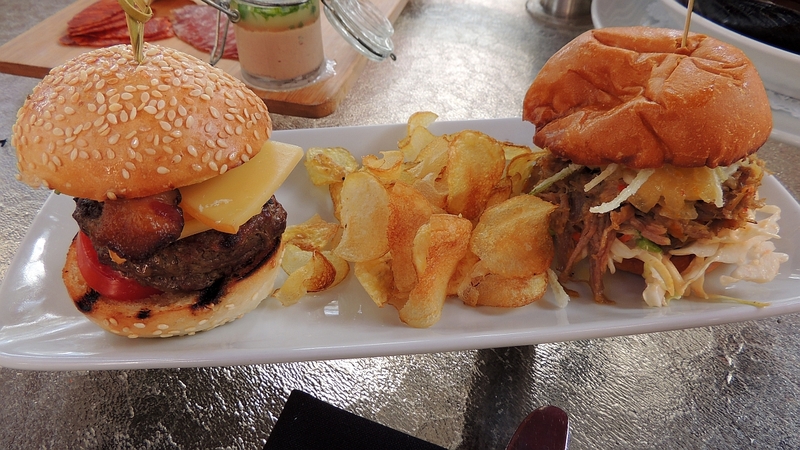 If I were to dine here again I would stick to the sliders, which were very nice. Hmmm.. I wonder if you could put all three straws in your mouth at once and have Margarita mixture? 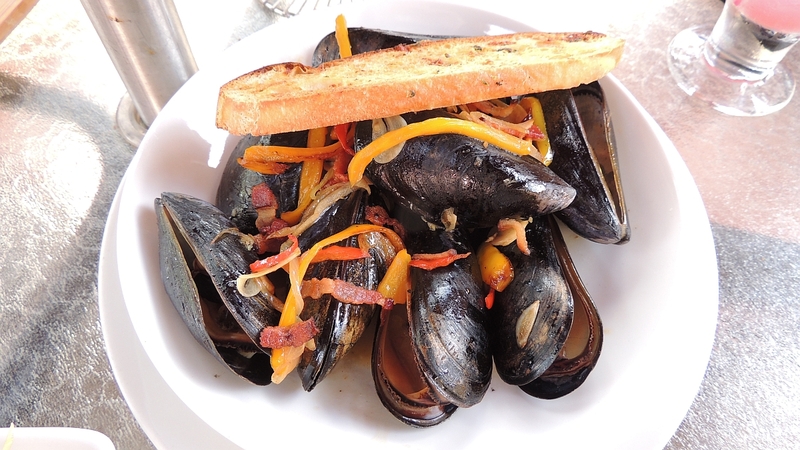 Nobody likes a cold mussel. Or a cold muscle come to that. The Sharcut .... Charcoot ...... the meat. We discuss what we are going to do next and all agree that we will catch the bus to the Magic Kingdom. 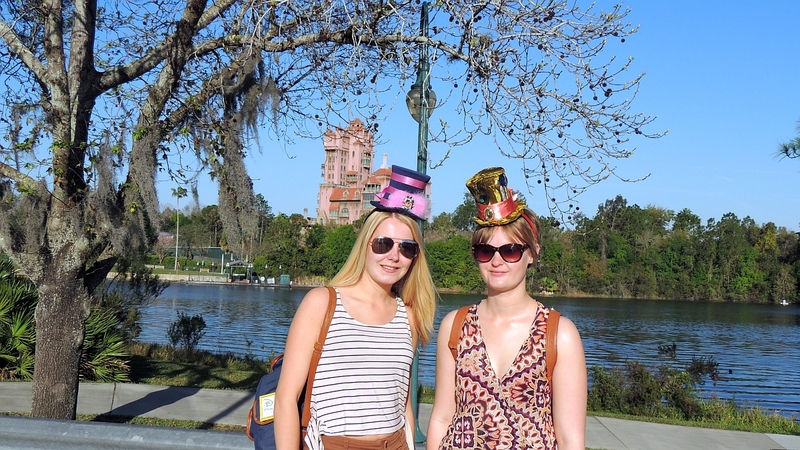 Hollywood Studios is not our favourite park and weve done all we want to do here. 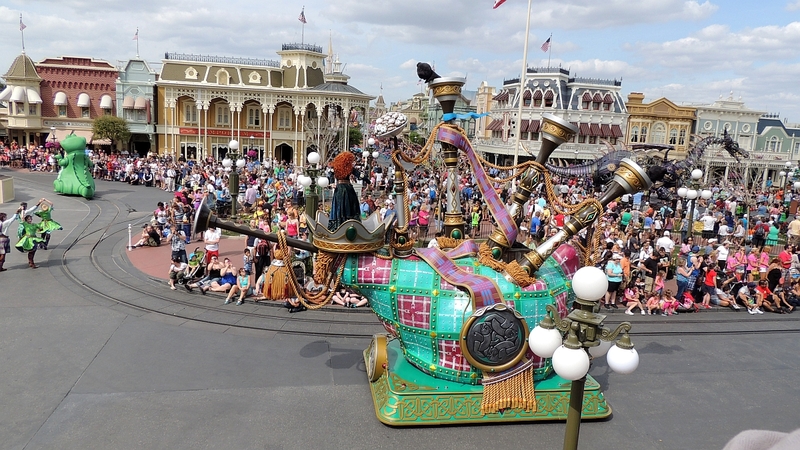 The wait at the bus stop is about 10 minutes and we arrive at the Magic Kingdom at 3.30pm. 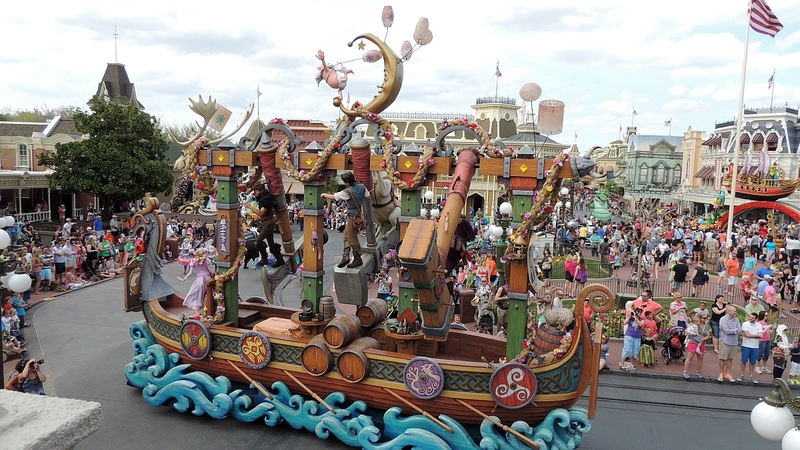 We thought we might be lucky and catch the end of the new parade, but with impeccable timing it is just coming down Main Street. We watch from the platform of the train station with only one or two people in front of us. 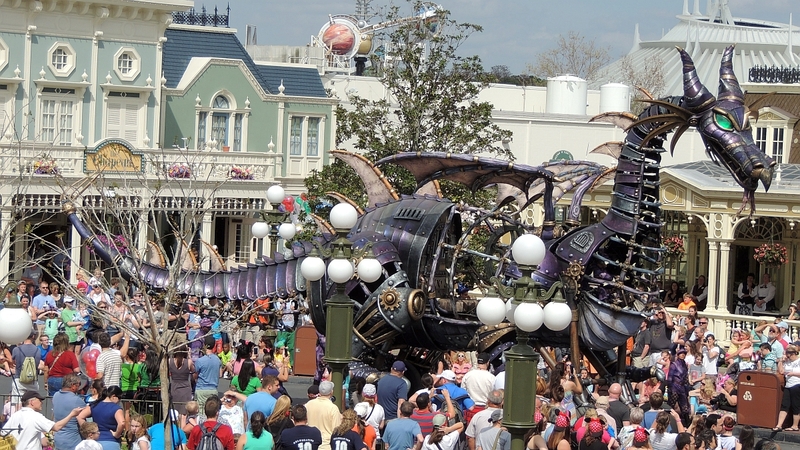 The parade is really good, especially the large steampunk dragon. As soon as its over we leave and catch the boat across to the Wilderness Lodge for a little relaxation on the beach. With a 2.00am closing time at the Magic Kingdom tonight, Tam is going to need to recharge her Disney batteries if shes going to make it through. The pool is packed, but there are plenty of sunbeds and lots of space on the beach by Bay Lake. 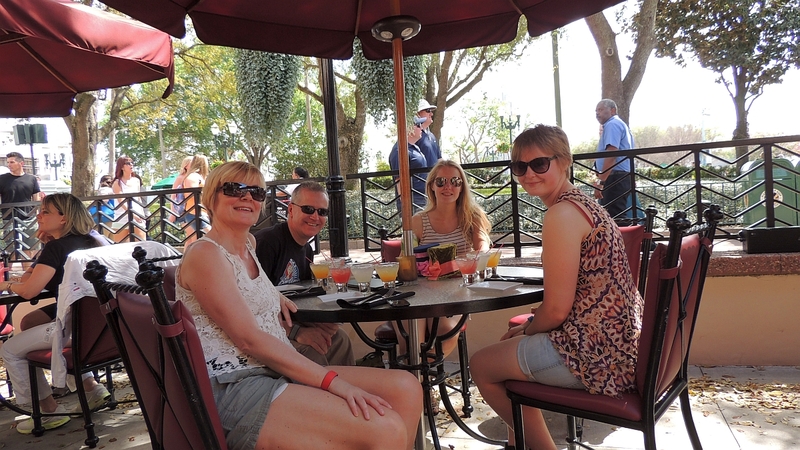 After 90 minutes enjoying the sunshine we decide to get a drink before getting the boat to the Magic Kingdom. Rather than sit at the pool bar we go to the Territory Lounge, where Tam and I have a Red Sangria, which neither of us particularly enjoy. As we look at the menu , the food items look quite good and India says she fancies the flatbread, so we buy one of these and a large basket of fries between the 4 of us, along with another beer for me. Around 7.00pm we ride the boat back to the Magic Kingdom. Walking up Main Street we bump into Joh and Sian. Its amazing how often you meet someone you know among the thousands of people in a theme park. They are just heading out, so we chat for a while and then say farewell. 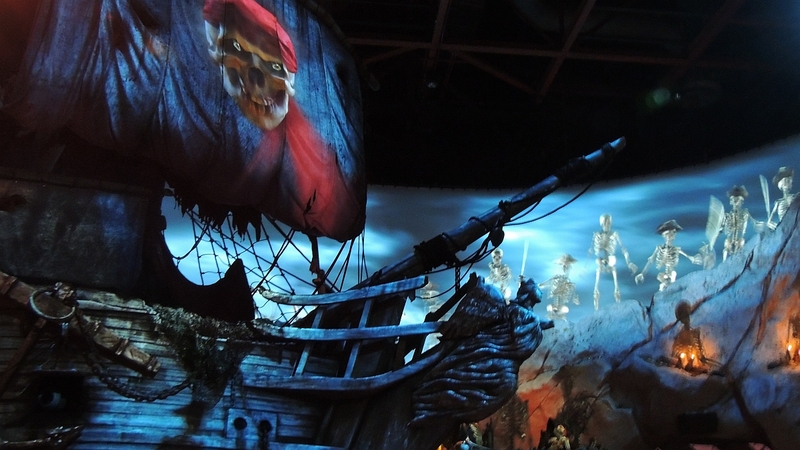 On to Pirates where there is a 20-minute wait. We then walk round to the Haunted Mansion where the pre-show is spoiled somewhat by a tour group of youngsters making a lot of noise. There was a big cheerleader contest going on in Disneys Hollywood Studios and there are lots of groups roaming around the parks. To be fair, they are mostly well behaved, its only one or two that cause a nuisance. Wishes is next and we catch the end of the projection show, Celebrate the Magic, as we take up a position to the right hand side of the hub. The fireworks are as wonderful as ever. Many people leave after Wishes, so we move to just in front of the castle to watch the second showing of Celebrate the Magic from a better vantage point. As we wait, Tam goes to sit on the curb for a while. Shes flagging at this point, but trying to hide it as she doesnt want to spoil the fun for the rest of us. Shes done pretty well today to be fair to the poor old girl. The projection show is so good. You see things at the bottom of the castle when you are close that you miss from further back. The Frozen section is particularly well received. This is bound to end up as a Broadway show. Over to Big Thunder Mountain, where there is a 20 minute wait before going to Gastons Tavern as Georgia has been itching to have a Cinnamon Roll. Actually, we have one between the 4 of us, as the thing is so huge. We decide to ride Pooh and Buzz before leaving the park. Humiliation is heaped upon me once again after Buzz. Fathers score 38,000, Georgias score 45,000, Indias score 490,000! I dont believe it  beaten hollow twice in a day by the daughters. My only consolation is that I beat Tam, mind you, thats a bit like taking candy off a baby. Of course, the girls take the opportunity to brag. The chickens have come home to roost. After all the years of rubbing their noses in it after every ride of Buzz, I guess they are entitled. They reckon Im finally over the top. This will be remembered for the next competitive Stringer outing  whenever that may be. On the way out Tam suddenly wakes up and declares that she wants a hot dog. This is strange on two levels. One  that she has gone from a zombie like state to wide-awake in a few minutes, and two  she isnt usually a big fan of hot dogs. I have long ago come to the understanding that my wife is a strange and fickle creature. Anyway, we have 2 hotdogs between the 4 of us and then make our way out of the park. We part with the girls at the bus stop as they are off back to their home in Port Orleans French Quarter. Tam and I are back in the room and in bed at 1.45am.